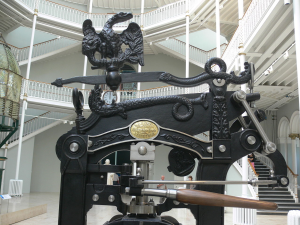 There’s a lot going on at the National Museum of Scotland. This is one of (or possibly the) most popular of our top Scottish attractions. There’s something here for everyone. If you’re in Edinburgh, or anywhere near, you should make a point of visiting, but do plan it well, because you can spend a whole day (or more) here. The close proximity of The Royal Mile and Edinburgh Castle, make this great museum a magnet for tourists. 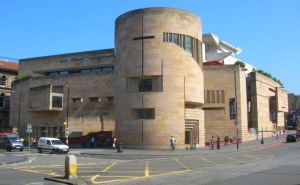 This latest building is the result of two former museums, The Museum of Scotland, and The Royal Museum, merging together to become known as The National Museum of Scotland. A £47.4m investment transformed the older part of the building in 2011, and it paid off. This may be slightly off topic, but everywhere I go, I eat, so…. If you have enough time to spare, venture up to the rooftop terrace on level 7, where you’ll find the Tower restaurant, so you can enjoy good food, and stunning views across the City of Edinburgh, including of course, the famous Edinburgh Castle. At ground level, you can have lunch in Museum Brasserie, an excellent restaurant, and recipient of the Quality Assured “Taste Our Best” mark from Visit Scotland. The unusual surroundings are a great focal point, and a conversation piece. It has been built under dressed-stone vaults, but still somehow exudes a modern warm and inviting ambience. A SNIPPET OF WHAT’S INSIDE THE MUSEUM…. Your visit here will take you back in time and you’ll follow and discover the history of life, not only in Scotland, but the world. It’s fascinating. You’ll also follow and discover how nature, art, design, fashion, and science and technology have progressed throughout the ages. This is an old printing press pictured here. The extensive and enviable range of collections (there are over 20,000 of them) vary from Scottish and international archaeology from the prehistoric age, to the science and technology of the modern age, to applied arts and design, and much more. 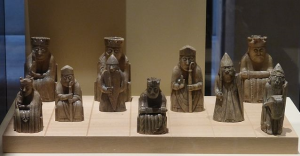 The Lewis Chessmen, pictured here, is just a single example. I think you’ll understand that there’s not nearly enough room on this page to showcase the whole range of display items. Seriously though, do not try and fit in a visit here if you have a couple of hours to spare. With more than thirty galleries in all, and each one interesting enough to hold your attention, it will require a full day, and possibly more if you want to view everything. The museum is open every day of the year, with the exception of Christmas day. *TIP: ASK AT RECEPTION FOR DETAILS OF FREE GUIDED TOURS. 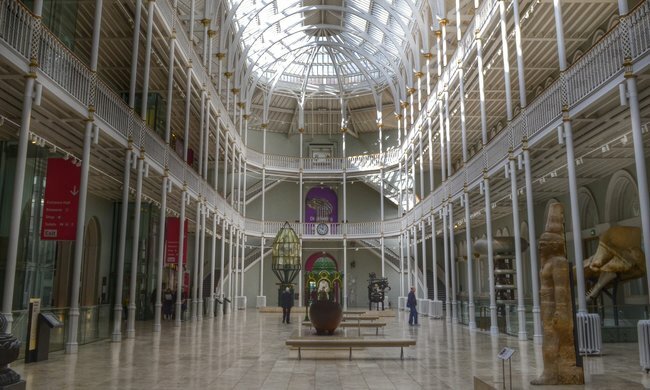 IN AND AROUND EDINBURGH: Apart from this Museum, Edinburgh has a multitude of visitor attractions, including Edinburgh Castle, The Royal Mile, more castles and more museums, cathedrals, Holyrood Palace and the Edinburgh Dungeon. Read More….